Is there anything better than a cosy little den to hide in? As a kid I loved making forts or dens out of clothes airers and sheets, or hiding underneath my bed and creating my own little imaginary world – far away from my three older brothers who were usually looking for someone to kick footballs at. 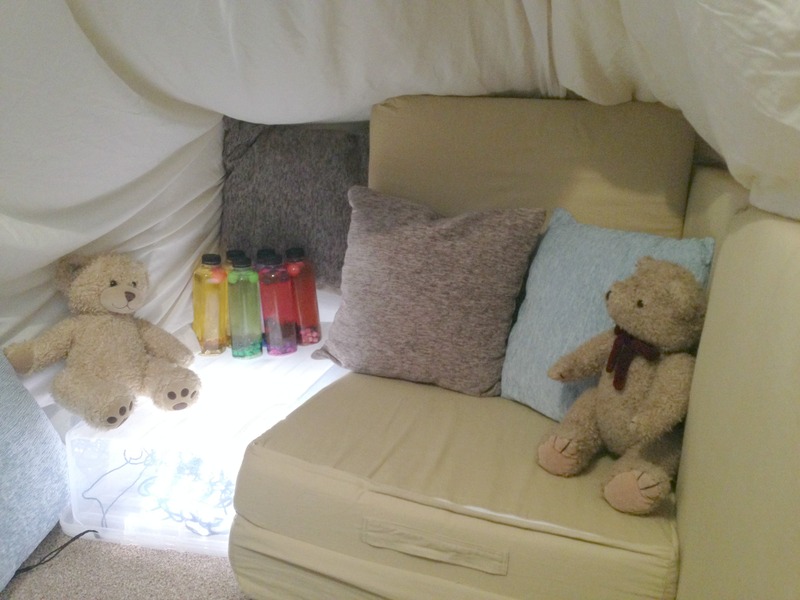 My lifelong love for cosy nooks and corners meant that I was super excited to be invited to participate in the February Fort Building Challenge, hosted by the lovely Louise at Building Blocks and Acorns. 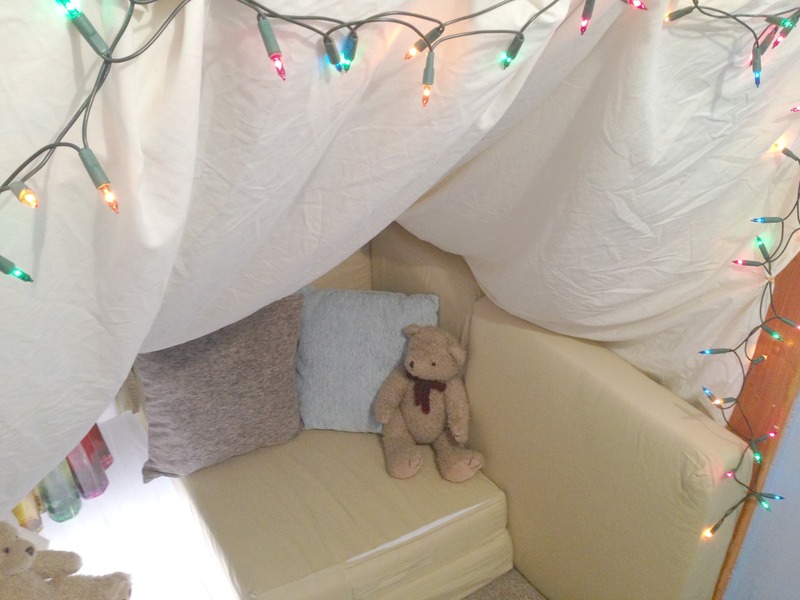 For the entire month a group of fantastic bloggers will be bringing you a collection of amazing forts for kids to enjoy. You can find the collection of amazing forts here. 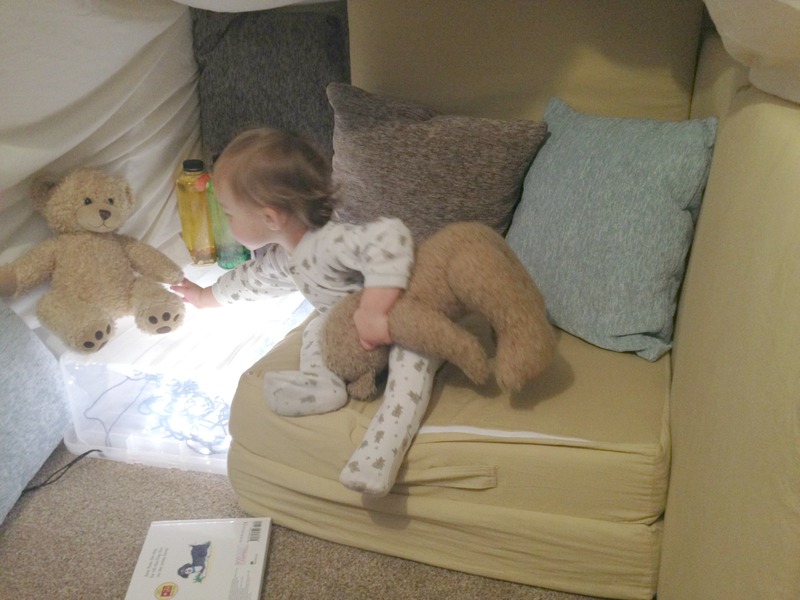 Building Blocks and Acorns – Fort Building Challenge. I was fortunate enough to be tasked with creating a Cosy Corner, how fun! We live in a 300 year old cottage which has lots of little nooks and crannies that just lend themselves to becoming a magical toddler den. I chose an unused alcove in Buddy’s bedroom, which will no doubt be filled in the near future with Buddy’s younger brother or sister! Not very cosy right? Fortunately that’s nothing that couldn’t be fixed by some bedsheets, fairy lights and lots of cushions! To create Buddy’s cosy corner I pinned two bed sheets to the ceiling and then propped them up against the back of the cupboard using these super funky multi-functional pillows we bought from Amazon. We don’t have a spare bedroom so these cushions are great to use as guest mattresses or spare seating when we have visitors! Buddy likes to use them as a trampoline most of the time. 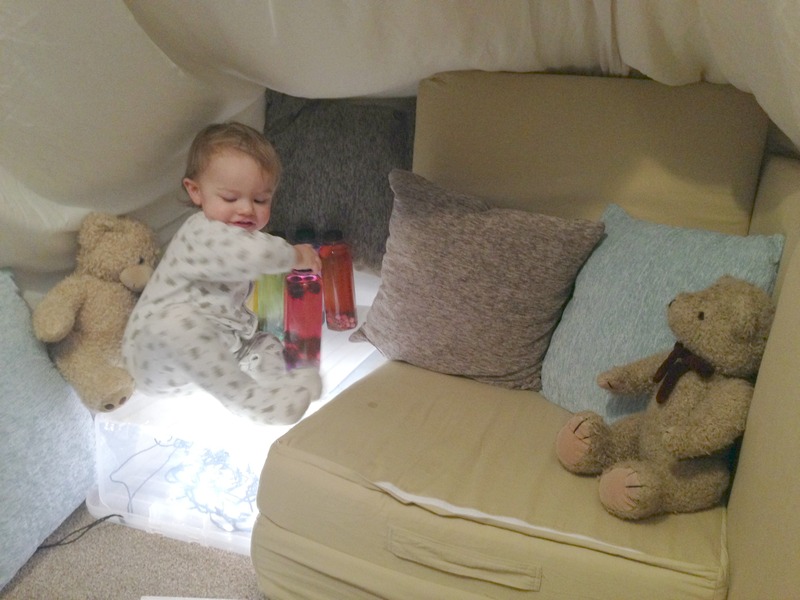 I then added Buddy’s homemade light table to add a fun, toddler safe glow to the cosy corner. I really wanted the Cosy Corner to be a relaxing, soothing and quiet space where we could enjoy some quiet activities together. Yes, quiet time with a toddler is as rare as gold dust but when it happens it is pure bliss! 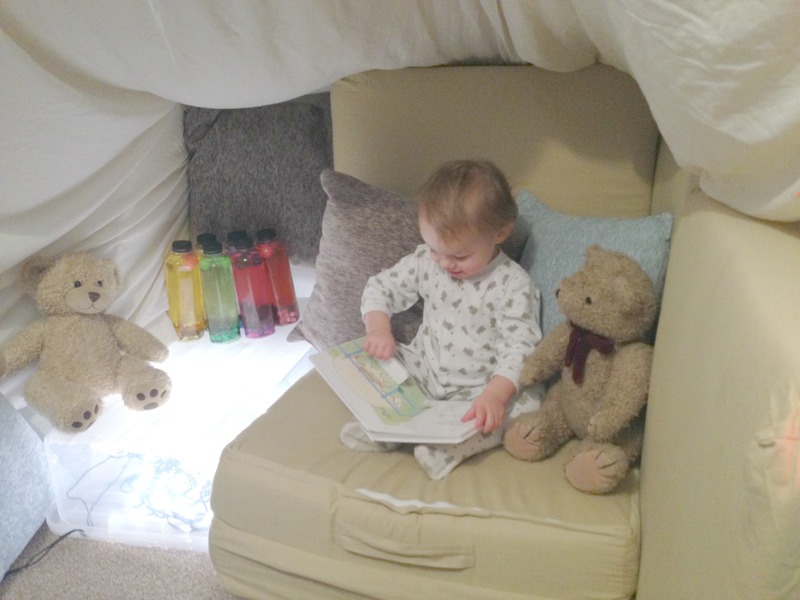 Buddy enjoyed reading in his cosy corner and snuggled into the cushions immediately. Anything that encourages reading is a big win in my book! Of course, he didn’t sit still for long, not when there was an entire Cosy Corner to investigate and explore! This Cosy Corner was a huge hit for us and has kept Buddy entertained for almost an hour at a time, of course we have to provide more books to enjoy an hours worth of Corner fun! 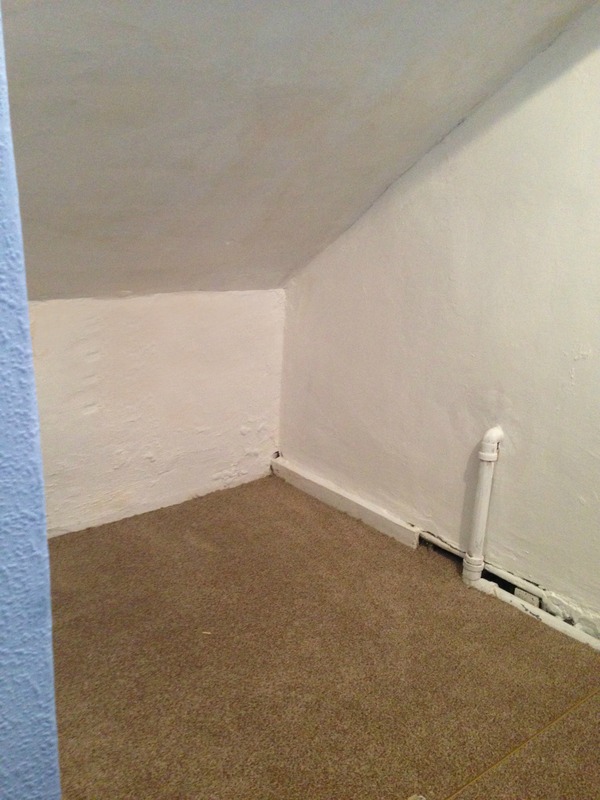 I hope you enjoyed this comfy and easy to prepare corner! Don’t forget to check out all of the other Forts on the following link.